This is quite possibly the greatest supported bikepacking trip in South America! We’ll bike around Mt. Ausangate (6,380 m; 20,931 ft.), several hours to the south of Cusco, crossing over three mountain passes that hover at more than 5,000 m (16,404 ft.) of elevation! Along the way, we’ll make camp alongside reinvigorating hot springs and enchanting turquoise-colored lagunas. The Mt. 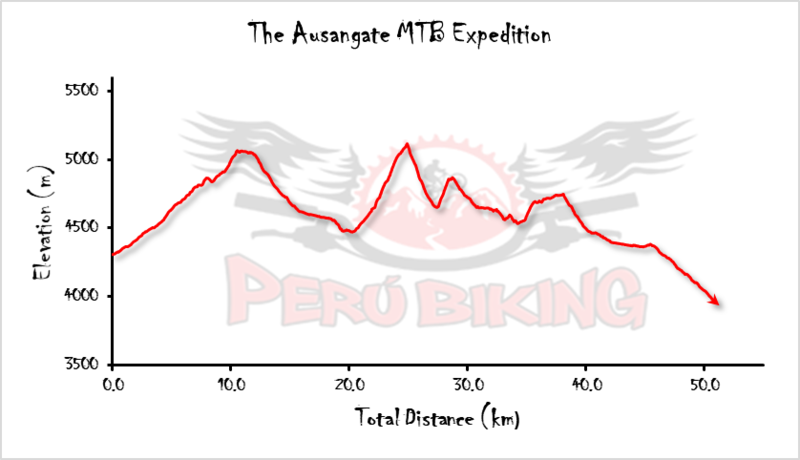 Ausangate Circuit is more than a trail. It’s a butterflies-in-your-stomach, lick-your-lips challenge that won’t be denied. The views, flora and fauna, and local communities encountered along the way are one-of-a-kind, the types of experiences and places that are truly unforgettable and unattainable anywhere else in this world. Climb to above 5,000 m (16,400 ft.) three times! Day 1: Welcome to Cusco. It's on! Whether your plan is to strictly bike or to include our package as a part of an extended visit to Cusco, we’re happy to accommodate you – and your bike. We’ll arrange pick-up at Cusco’s Alejandro Velasco Astete International Airport and help to get you settled and relaxed. Furthermore, our bike workshop is available for use to get your mountain beast assembled and ready for some one-of-a-kind trails! Just let us know how we can help. Ride time: 4 hrs. Shuttle time: 2 hrs. Cusco’s South Valley is a little known hot spot for mountain biking, even for Cusco area riders. We’ve ripped these trails for years and believe them to be some of the best around. As we’ll already be headed south towards Mt. 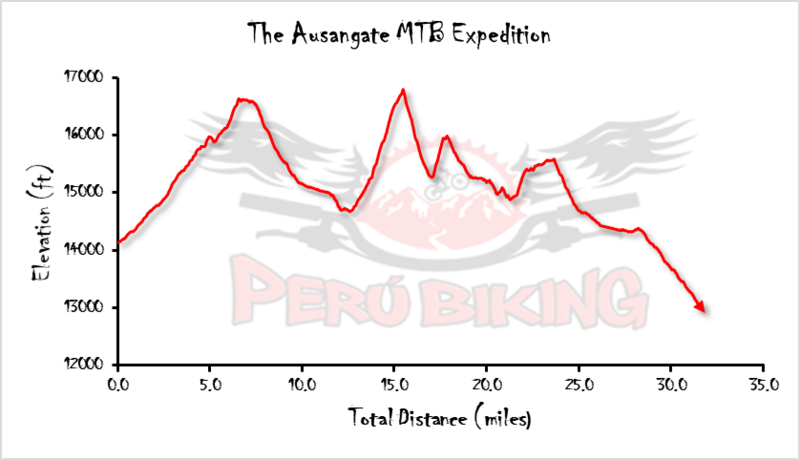 Ausangate, why not stop in to warm up for the expedition ahead? We’ll ride two trails in the South Valley. The first, an Enduro style ride starts at 4,520 m (14,826 ft.) – which should give riders a hearty dose of altitude in preparation for some of Mt. Ausangate’s mountain passes. We’ll have a chance to pedal and flow along narrow singletracks and technical descents that eventually lead to the town of Andahuaylillas. After catching our breath in Andahuaylillas’ central square, we’ll shuttle to the top of a second trail, this time in pursuit of more verticality! Just brake and flow through this bomber, feature-packed singletrack straight down towards our lodge, where we’ll relax for the rest of the afternoon. We’ll shuttle our way to the mountain village of Pachanta (4,310 m; 14,140), where we’ll load our mules with camping gear and provisions for the ride. From Pachanta, we’ll begin a slow ascent towards Laguna Q’omercocha along a wide trail suitable for climbing at altitude. We’ll make camp along the banks of Laguna Q'omercocha and enjoy the peaceful evening hours to rest our legs and take in our impressive surroundings. We’ll break down camp with the sunrise and start a demanding hike-a-bike towards the Q’ampa Pass, where we’ll reach over 5,070 m of elevation and stare into massive glaciers on either side of the pass. The weather at the Q’ampa Pass is unpredictable, hence we’ll prepare ourselves for both snowstorms and epic blue skies. From the pass, the real MTB fun begins – a singletrack descent through a glacial valley surrounded by 6,000 m peaks. We’ll descend along the flanks of the massive Ausangate and through the now verdant valley of Q’ampa, once hewn by giant glaciers and now full of alpacas and llamas. We’ll finish today’s ride in the mountain hamlet of Chillca, where we’ll make our camp amongst the homes of several locals, a special opportunity to see what Andean life at 4,500 m (14,765 ft) of elevation really looks like in person. We’ll begin a challenging hike-a-bike to our maximum point of ascent, the Palomani Pass (5,115 m; 16,780 ft). Today’s climb is strenuous, so we’ll start early and maintain a very manageable, yet steady pace. We’ll be closer to Ausangate’s massive glaciers than any of the prior days, close enough to hear the creaking of the immense sheets of ice and the echoes of falling rocks. Our first descent drifts down steep rocky switchbacks towards Laguna Ausangate, a glacial lake at the foot of Mt. Ausangate. Later, we’ll hike-a-bike once more to the Apuchata Pass (4,870 m; 15,975 ft) before descending towards a cluster of unworldly turquoise-colored lakes. These lakes will serve as the backdrop for our last campsite. In the evening we’ll have time to wander the shores of these glacial lakes before resting. Many visitors of the Cusco Region hear and perhaps visit the much-promoted Rainbow Mountain, well-known for its natural lines that paint the impression of a rainbow. Well, a little-known secret is that Ausangate’s surrounding range is nothing but a veritable collection of “Rainbow Mountains”. As we begin our final ride today, the Rainbow Mountains will bid us farewell in epic fashion. However, if your plan is to go immediately to Cusco’s Alejandro Velasco Astete International Airport, we’ll make sure you get there stress-free and on time. We hope to ride with you again!